The Brooklyn Paper has a preview of tonight’s DOT Presentation on the Prospect Park West Bike Lane. Unsurprisingly, the effects are positive. Crashes are down from an average of 30 in six months to 25, or 16 percent. Crashes that cause injuries are down from 5.3 in six months to two, a whopping 63-percent drop. Before the project, a crash was twice as likely to include an injury. Injuries to all street users dropped 21 percent. The data also found that since the lane was installed last June, there have been no reported pedestrian injuries and no pedestrian or cyclist injuries from pedestrian-bike crashes. Emphasis mine. Zero bike-on-ped accidents. Zero. That’s not to say one might not happen in the future, but if it does it won’t be the bike lane’s fault, but a question of odds and bad luck. The bike lane is working and, best of all, it’s making pedestrians safer from cars. This is not a case where, to use a cliche, reasonable people can disagree. Not in the least. Reasonable people can look at the facts, at data, and at study after study and only conclude one thing: the redesign of PPW is a success and you and your neighbors are safer as a result. Only unreasonable people disagree with that. 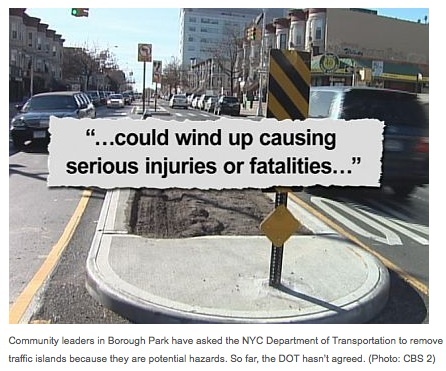 “…Could wind up causing serious injuries or fatalities…” Except that it hasn’t. Not once. When redesigning streets to enhance pedestrian safety, the DOT looks at data and conducts before-and-after comparisons, as it did on PPW. But studies and facts don’t matter to opponents of pedestrian safety. All that matters is repeating the same fear-based mantra enough times so that a lazy local media creates a visual like the one above, lending it the kind of credence that only TV can. All that matters is more cars, more cars, more cars. I don’t know if any media will be there tonight, but if they are, don’t let them give a megaphone to a few scared but politically connected NIMBYs. AND…..! Reduction of sidewalk riding from 46% to 3%. That’s another win for Pedestrians. PPW has a very wide sidewalk on the park side and since there is no way to go from Bartel Pritchard to Grand Army Plaza without going all the way around the park, people would ride, slowly and carefully for the most part, on the sidewalk. However careful they are though, it is still illegal and annoying to peds. I’m so glad the bike lane, which being two way makes it so much better, eliminated the behavior.